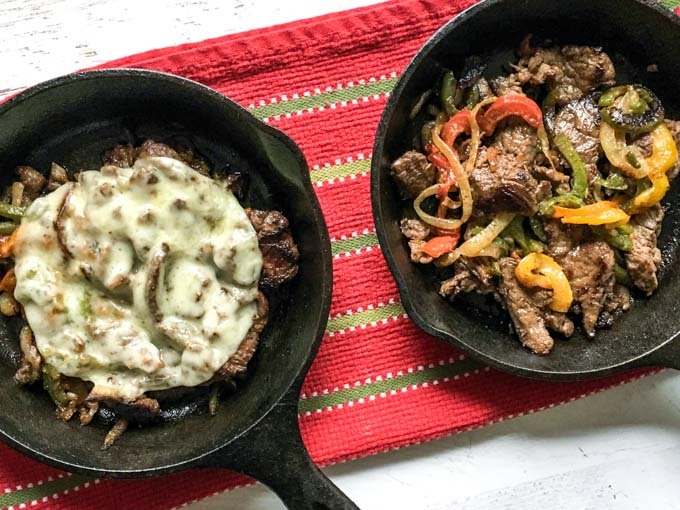 Keto Philly Cheesesteak and Waffles - tasty low carb dinner! I’m sure I’ve mentioned before that we love peppers and onions on just about anything. 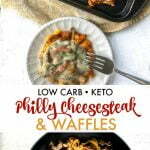 In this keto Philly cheesesteak and waffles recipe I’ve added a good piece of beef and a savory cheese waffle and it was delicious! It’s a very easy keto recipe and I think everyone will like it! Best of all for me, each serving has only 3.5g net carbs. Typically a Philly cheesesteak is made with thinly cut ribeye steak which can be a bit expensive. Also sometimes your grocery store will have beef already sliced up for a cheesesteak. I wanted to use Certified Angus Beef ® brand so after discussing this with the butcher at Giant Eagle I decided to try a sirloin steak. He was worried I’d have trouble cutting it thin but I found away. My husband told me this trick. Just freeze the meat for about an hour before using and it will be much easier to slice. Also use a good knife which I bought from Cutco many many years ago. To me a cheesesteak involves good beef, thinly cut onions and peppers and a good melty cheese on top. 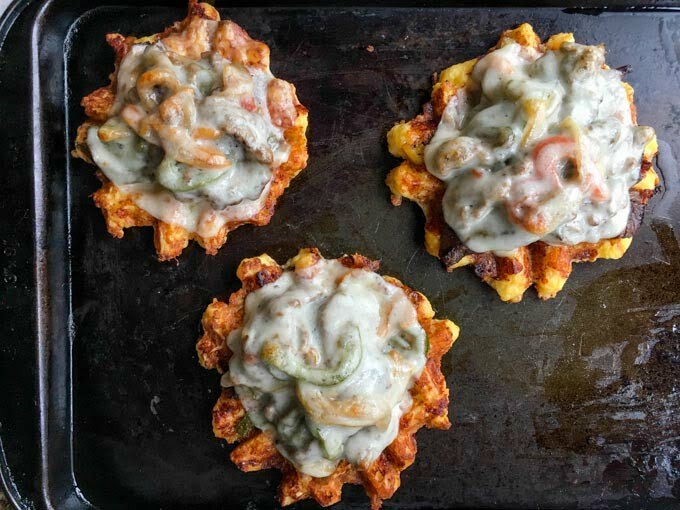 Being keto the bun is kind of out the question but I got around that by using my cheese waffles. They were dynamite together! I would venture to say they were even better than a bun. In a large saute pan, add some oil and heat to medium high. Add the steak, peppers and onions and sprinkle with salt and pepper. Saute until the meat is done and the vegetables are to your liking. Meanwhile make your cheese waffles (recipe here). Place waffles on a cookie sheet and then top with the meat mixture. Add a slice of provolone and set under the broiler until the cheese is melted. I like using a fork, however that doesn’t mean you can use two waffles to make a bun. It will be a little messier than your typical bun but it can be done. I personally like having more meat and vegetables than the cheese waffle so a open face sandwich worked better for me. You can also eat this straight from the skillet. I have these mini cast iron skillets that you can divide the meat up and place cheese on top. Eat it right from the skilled for an even lower carb dinner. I think I bought these skillets at Target many years ago but they have them on Amazon too!. I used them in the low carb skillet chocolate cake too. 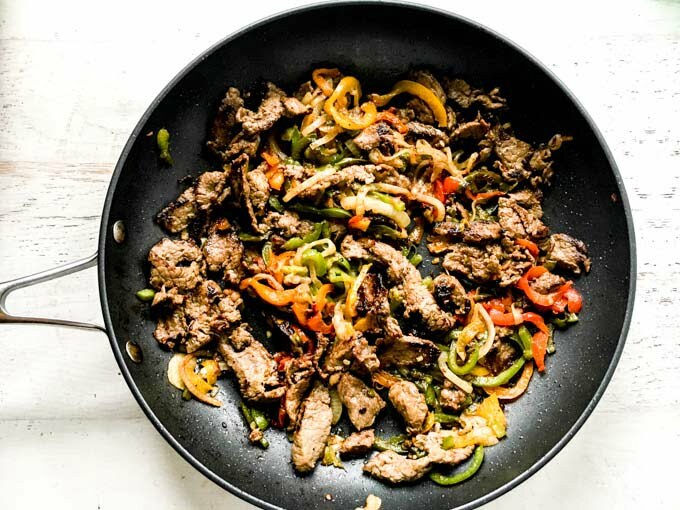 This keto Philly cheesesteak is really, really tasty and I could eat them right out of the pan. The following is the nutrition for the waffles and beef mixture separately.This assumes the meat makes 6 servings. 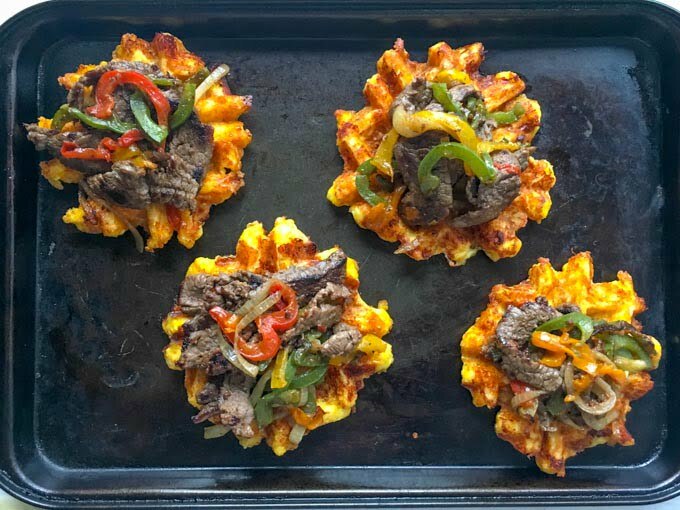 These keto Philly cheesesteaks and waffles are the perfect cure for those your cheesesteak cravings. Steak, peppers and onions topping a savory cheese waffle and covered in provolone cheese. One serving on 1 waffle is only 3.5g net carbs! Heat up a large skillet to medium high heat and add oil. When the oil is hot, add the meat, onions and peppers. Sprinkle salt and pepper over it and saute until the meat is done and the vegetables are soft - about 15 minutes. When both waffles and meat mixture is done, place six waffles on a cookie sheet. Divide the mixture on each waffle and top with a slice of provolone cheese. Place under the broiler until the cheese is melted. Note you can also eat this with the waffle. Try it right from the skillet. Just add the cheese at the end and place the whole skillet under the broiler. Previous Post: « Easy Low Carb Baked Fish with Green Beans – One Pan Dinner! What an absolute genius recipe. Never had this combo but I know this one is gonna be just magical!! You had me at cheesesteak and then again at waffles! My husband is such a cheesesteak fan but I rarely make it because I’m just not a fan of subs. More often than not it’s just too much bread for my taste. But I bet I would love it with a nice, crispy waffle underneath! We’ll definitely be giving this a try. My waffle maker is seriously underutilized, Now it might get some love because these cheesesteaks look delish! What is this goodness on your page! I a not a keto dieter but this still looks like its worth the bite! I have never thought of such an incredible combo, you’re a genius! I bet these taste incredible, can’t wait to make it for my hubby! 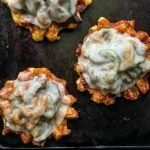 I LOVE the cheese waffle idea! Such a great twist on the traditional cheesesteak. 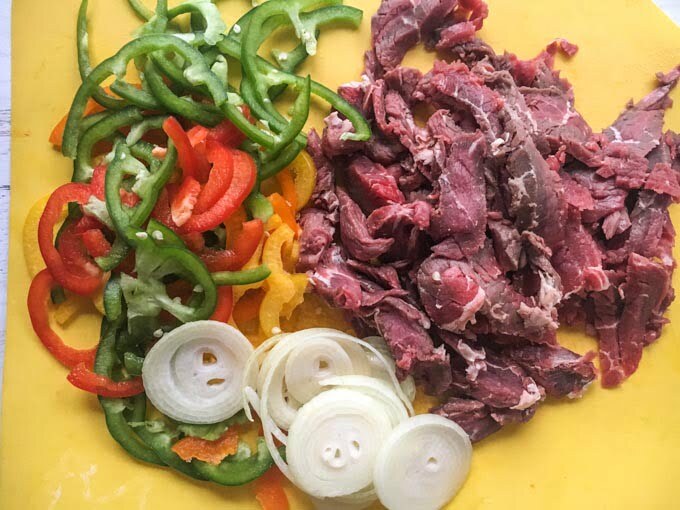 And I love a good cheesesteak too…I always overload mine with the peppers and onions. Cheese waffles topped with cheesesteak? Sign me up. 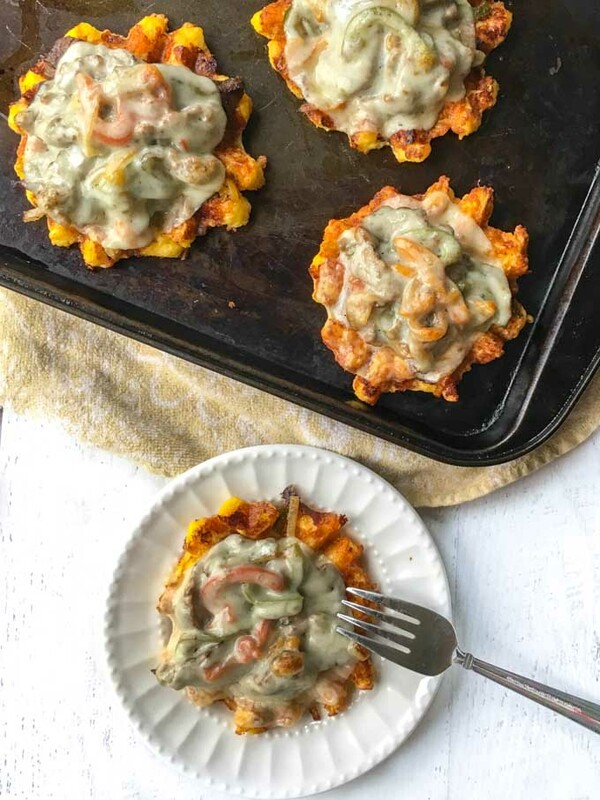 This is such a fun, low carb dinner idea! That melty cheese on top looks divine. What a great idea! I love onions and peppers with everything, can’t get enough of them! Love how this is low carb too, great recipe. I’m loving this low-carb and keto rendition of one of our favorite sandwich classics! Your incorporation of a waffle for this recipe is sheer genius! OMG this is such a unique recipe! 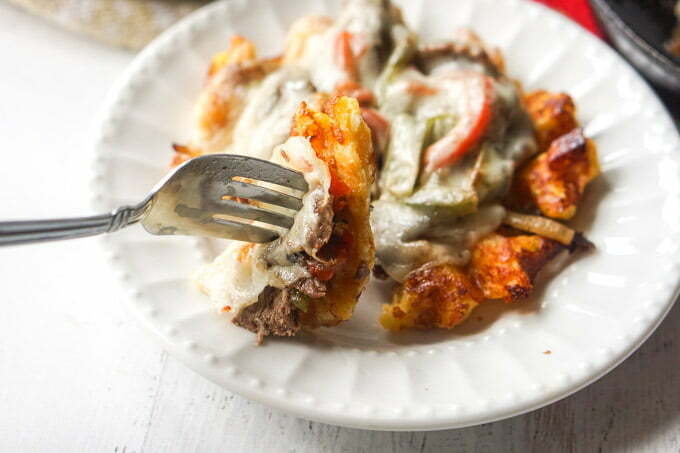 I LOVE the twist to this recipe using philly cheesesteak and waffles…. so savory and creamy! It’s my kind of recipe! 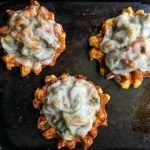 This is easily one of the most unique waffles recipes I’ve seen! Such a brilliant idea. And you can’t go wrong with those cheesesteak toppings. Thanks for sharing! Thanks Amanda! I’m always trying to find ways to eat my favorite foods in a low carb way!